Preface. Some comments on the structure of technology of plasticity in R&D and production (K. Lange). James Nasmyth (1808-1890): the steam hammer and the mechanics of vee-anvil forging (W. Johnson). Modeling dynamic strain localization in inelastic solids (M. Predeleanu). Void growth under triaxial stress state and its influence on sheet metal forming limits (R.C. Chaturvedi). The prediction of necking and wrinkles in deep-drawing processes using the FEM (E. Doege, T. El-Dsoki, D. Seibert). Constitutive models for microvoid nucleation, growth and coalescence in elastoplasticity, finite element reference modelling (J. Oudin, B. Bennani, P. Picart). Theoretical and numerical modelling of isotropic or anisotropic ductile damage in metal forming processes (J.C. Gelin). Research on forging processes for production &agr; + &bgr; titanium alloy TC11 disks (S. Chen et al.). Modelling of fracture initiation in metalforming processes (Y.Y. Zhu, S. Cescotto, A.-M. Habraken). Formability determination for production control (J.A. Schey). Design of experiments, a statistical method to analyse sheet metal forming defects effectively (D. Bauer, R. Leidolf). Formability, damage and corrosion resistance of coated steel sheets (J.Z. Gronostajski, Z.J. Gronostajski). Model of metal fracture in cold deformation and ductivity restoration by annealing (V.L. Kolmogorov). Prediction of necking in 3-D sheet metal forming processes with finite element simulation (M. Brunet). Deformability versus fracture limit diagrams (A.G. Atkins). Prediction of geometrical defects in sheet metal forming processes by semi-implicit FEM (A. Makinouch, M. Kawka). Evolution of structural anisotropy in metal forming processes (J. Tirosh). Computer aided design of optimised forgings (S. Tichkiewitch). Defects in thermal sprayed and vapour deposited thick and thin hardwearings coatings (M.S.J. Hashmi). A study of workability criteria in bulk forming processes (A.S. Wifi, N.El-Abbasi, A. Abdel-Hamid). Degradation of metal matrix composite under plastic straining (N. Kanetake, T. Choh). Crack prevention and increase of workability of brittle materials by cold extrusion (H.W. Wagener, J. Haats). 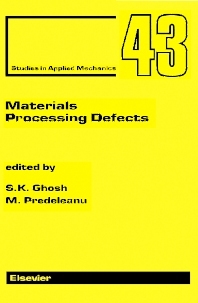 A database for some physical defects in metal forming processes (M.M. Al-Mousawi, A.M. Daragheh, S.K. Ghosh). Split ends and central burst defects in rolling (S. Turczyn, Z. Malinowski). Form-filling in forging and section-rolling (P.F. Thomson, C.-J. Chong, T. Ramakrishnan). The technological field of defects, and more appropriately, avoidance of them, is very current in perhaps all sectors of the manufacturing industry. This is particularly important to reduce/minimize waste everywhere to address lean production procedures. The recent advances in finite plasticity and visioplasticity, damage modelling, instability theories, fracture modelling, computer numerical techniques and process simulation etc. offer new approaches and tools for defect prediction, analyses and guidelines for designing components to be manufactured by traditional and emerging process technologies. This volume contains contributions from well known researchers and experts in the field presenting an up-to-date overview of advances in this area. Subjects covered include: micro- and macro-scale observation of defects; localization and instability analysis; damage modelling and fracture criteria; defect prediction methods; design considerations to avoid defects.